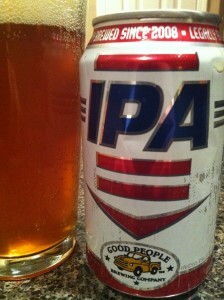 We have a new brewery to feature this week, Good People Brewing from Birmingham, Alabama. My favorite beer of theirs has usually been the Snake Handler DIPA, but this time Dustin brought us a can of their regular IPA. It uses primarily Willamette and Cascade hops, with a solid bitterness of 68 IBU and 7.7% abv. Usually the line between an IPA and a Double IPA is around 7.5%, but with Snake Handler on tap this is definitely the smaller of the two from an abv standpoint. Here's what they have to say: "Crisp and refreshing, the IPA packs an aromatic and flavorful punch reminiscent of the pine and floral bouquets of the original British-style. But we’ve added a little American flair with some West Coast hops, infusing citrus intimations to cut the British aggression. It finishes nice and dry with just enough bready backbone balance it out. Great for grilling out or any occasion where you are proud to be an American." Reviewers: Eric Ducote (BR Beer Scene), Dustin Davis, And Mandi Kaelberer. Appearance: Caramel color, nice head. Aroma: Caramel malts, spice and fruit aroma. Dustin said, "sweet maltiness meets citrus hoppiness." Taste: Really nice, I picked up plenty of citrus notes as well as a little piney hop flavor. Mouthfeel: A little more lingering bitterness than I like, but not bad. Overall: A really good IPA overall, nice hop notes, well balanced without being too malty, and easy to drink despite being on the extreme strong end for a single IPA. Mandi especially enjoyed this one, giving it a robust score of 88, while Dustin and I weren't far behind, both scoring it higher than an 80. One Week Until The Beer Bloggers' Conference! Santa Fe Brewing Coming To Louisiana!